9. Autumn cutting seems to be favouring the encroachment of Bracken. All three autumn cut sections had developed quite extensive stands of Bracken in the lower halves of the sections. 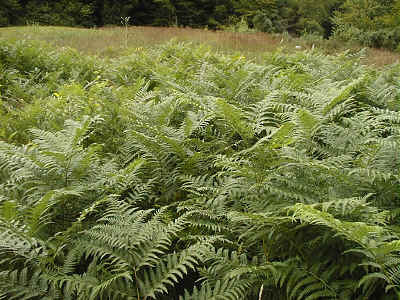 While Bracken was certainly present in spring cut sections, it was not nearly so prominent. 10. 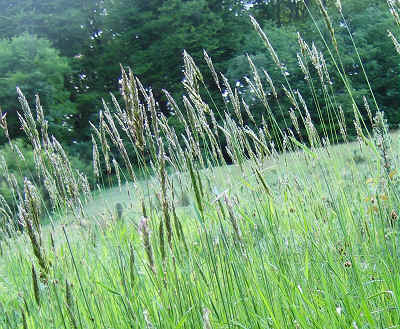 The grasses, Common Bent (Agrostis capillaris) and Yorkshire Fog (Holcus lanatus), have been the two most dominant species over the majority of the project site since the beginning of the experiment. Yorkshire Fog (left) is a very widespread and common grass in Britain occurring in a variety of habitats including waste ground, meadows, rough grassland and open woodland, as well as on a wide range of soils. This is an opportunistic species often regarded as something of a weed. By 2001, Yorkshire Fog was beginning to decline across much of the project site. 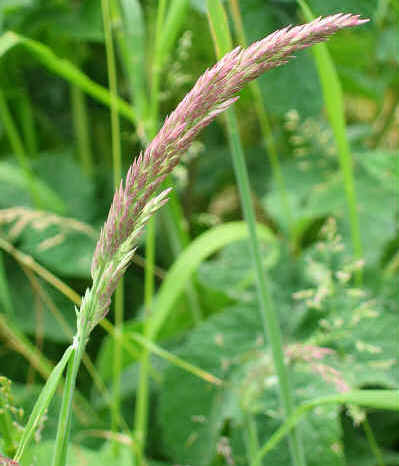 Common Bent (left, mixed with Yorkshire Fog) is also widespread and abundant in Britain on waste ground and in pastures. It can tolerate a wide range of soils, but is very common on poor, dry, acid soils. 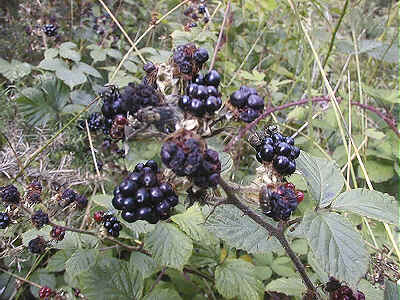 As a result, it is often an important component of heath and moorland vegetation. The ability of Common Bent to thrive on poor, acid soils may explain the fact that it is continuing to thrive on the project site, while Yorkshire Fog is declining overall. Other grasses more characteristic of heaths have also colonized the project site. 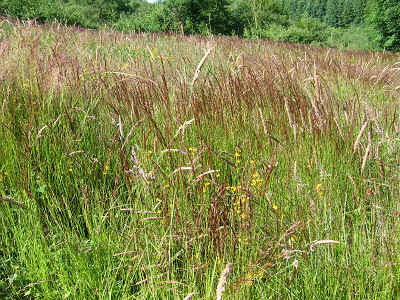 These include Sweet Vernal Grass (left), Bristle Bent and Purple Moor Grass. 11. The use of Kerb granules to control the regeneration of grasses in the initial stages of recolonization of the project site has had the most profound effect of any of the management methods. Section 7 was completely unlike any of the other sections on the project site. This section is cut annually in the spring, as are sections 2 and 4. However, the management of section 7 has differed from the other spring cut sections in that Kerb granules were also used once initially to control the regeneration of grasses. Section 7 is not only extremely different to the other spring cut sections, but is also visibly entirely different to the differently managed sections on either side of it which share similar environmental conditions. The observed differences exactly follow the white boundary markers all the way up the section (left). This clearly shows that the marked differences in vegetation in section 7 are a direct result of the management regime applied to this section alone. The initial restriction of grass growth in this section seems to have been vitally important, allowing other species (particularly sedges, gorse and heathers) the chance to become sufficiently established to successfully compete with the grasses. 12. 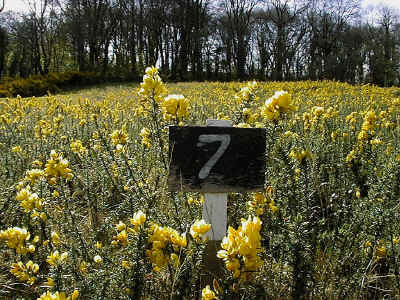 The use of Garlon to control gorse in section 7 had no effect whatsoever. 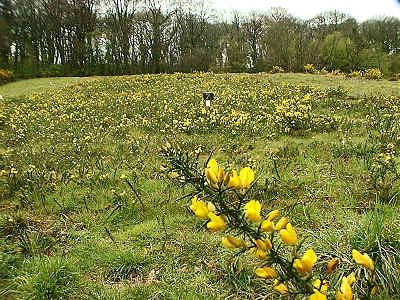 Garlon was used once initially on section 7 to control gorse. The picture (left) clearly shows how effective it was! The section was only treated once with Garlon. The results would be very different with repeated applications. The fact that grasses were also controlled in this section initially may have played a contributing role in allowing the gorse to get a head start and become extremely dominant. 13. Brushcutting three times a year has resulted in the development of a diverse meadow habitat in section 6. The regular cutting in section 6 has prevented any one plant from becoming too tall, allowing a diversity of flowers to flourish. 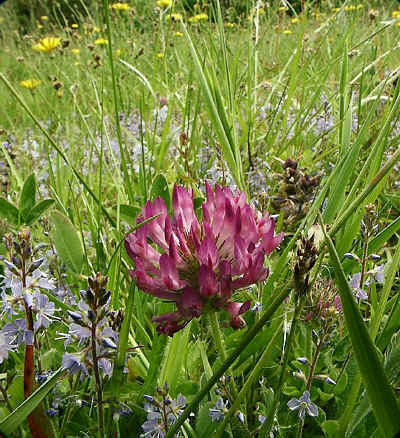 The picture shows clover (pink), Heath Speedwell (blue) and Cat's-ear (yellow) all flowering in amongst the grasses and woodrushes. Greater Bird's-foot Trefoil, violets and Bugle were also very common in the grassy sward. 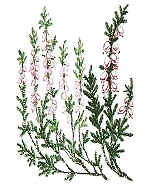 Section 6 contained quantities of Heather (although very little Bell Heather). The frequent cutting has caused the Heather clumps in this section to become extremely dense and thick, severely restricting the establishment of any other plant species in its midst. In the long term, this management may result in the most robust development of Heather. 14. Brushcutting three times a year was the only management regime which inhibited the spread of Brambles. Bramble has been one of the most dominant species on the project site since the start of the expermient. It had established in every single section and occurred with a percentage frequency of 50% or higher in all sections apart from section 6. In section 6 the percentage frequency of occurrence was only 10%.